Cristian Achieved His Dream of Flying Thanks to You! Cristian L. (NMC ’17) thanks you for helping him fly high!Cristian L. (NMC ’17) wanted more than anything to become a regional airline pilot. He served in the marine corps as an airframe mechanic for five years while trying to save money for school. When his contract ended with the marines, he had to decide where to go next. He wanted to get the best training possible and to be able to afford it. 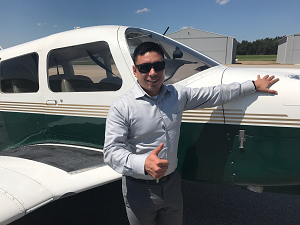 Thanks to your support of NMC’s Aviation Program, Cristian found what he was looking for at NMC. He is thankful for those who have helped him throughout this journey. “The instructors are tough, but fair. They push you to your limits. No matter how well you fly, they will teach you more to help you to continue to improve. I’m very thankful for that,” he says. Cristian graduated with his associate degree in the spring of 2017, and plans on furthering his education at Davenport University through NMC’s University Center. Because of your support, NMC aviation is a rigorous program that is affordable to students like Cristian. And, because of you, he is on his way to achieving his dream of becoming a regional airline pilot.